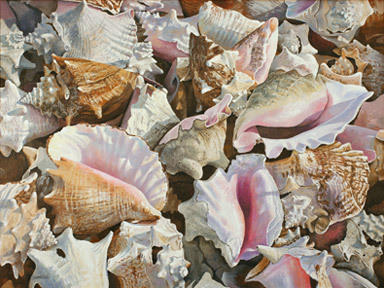 Bern Sundell”s giclee print of Bahama Treasures is taken from the original acrylic painting on canvas of colorful piles of conch shells in radiant light. Bahama Treasures shows the well known piles of conch shells at the docks in the Bahamas, complete with the holes where the edible parts were extracted. The play of light across the shells lifts the composition into the clear radiance of those days on the water fishing, a reminder of tarpon, bonefish, and barracuda followed by great meals in the evening. This painting is 40″ wide by 30″ high created with acrylic paint on canvas and has been sold. For gifts or to enjoy in your own home, giclee prints of this painting are also available.